Our caring team of professionals is available 24 hours a day, 7 days a week to provide expert home care. Boca Raton residents as well as those looking for assisted living facilities in Broward County, can contact us anytime. As a courtesy to our patients we accept assignment of benefits and provide free home care assessments to families looking for assisted living facilities. Palm Beach County and other area residents are welcome to contact us anytime for any further details about our services. 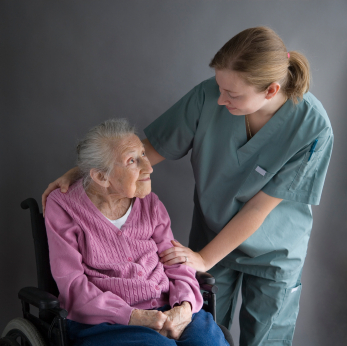 The Home Health Aide shall have training in those supportive services which are required to provide and maintain bodily and emotional comfort and to assist the patient toward independent living in a safe environment. Assist patient with bathing (bed or tub) and/or showering. Assist patient with oral care (care of teeth and mouth). Assist patient with grooming (nail care for non-diabetics, shaving and care of hair). Assist patient with getting dressed. Assist patient with ambulatory activity (wheelchair, walker, cane). Assist patient with transferring (to and from bed, chair, bedpan or commode). Prepare and serve meals for patient (following specific diets if so instructed). Assist patient with prescribed range of motion exercises. Accompany patient to and from doctors appointments. Assist patient with bathroom activities. Remind patient to take medication. Accompany the patient for walk. Observe, report and document patient status and the care or services provided. Wash the patient’s personal laundry. Food shop for the patient whenever needed. Tidy kitchen after food preparation. Make the patient’s bed and change the linens as needed. Dust and vacuum the patient’s living areas (bedroom, living room or den, etc.). Shop for the patient’s pharmaceutical supplies. Keep the patient’s bathroom clean. Please note that actual services rendered will depend upon the patient’s needs, aide’s schedule and insurance benefits where long term care insurance applies.